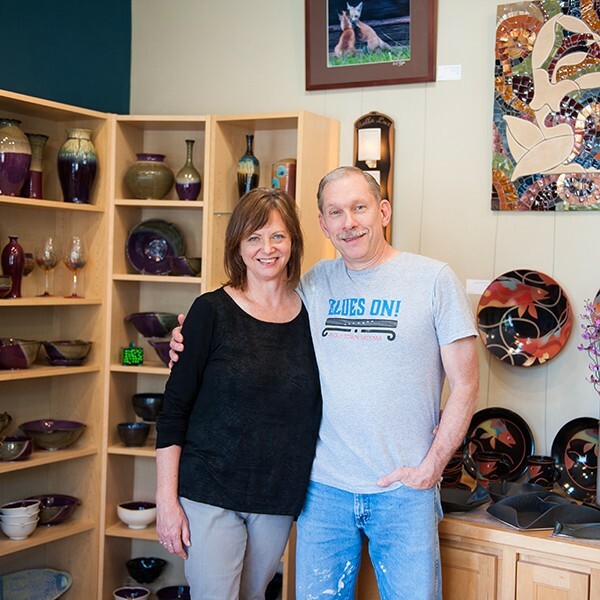 In January 2011, Mark and Eileen Hudak opened Throwing Mud Gallery in Tacoma’s historic Old Town neighborhood with the hopes of sharing their passion for pottery with the community. Over seven years later, they have a thriving business built on helping people create art and connect with one another. Besides classes, Throwing Mud offers drop-in studio time to anyone wanting to add their own creative touch to existing bisque pottery pieces. Classes mix beginners with advanced students and hold up to 10 students. Those interested are encouraged to take a Try It class first. Students spend an hour learning the basics and then they “try it” before committing to a full course. Mark and Eileen have observed that as adults, we don’t always take time to have fun, learn something new and be creative. Throwing Mud Gallery, they say, has become a place where people can learn a new skill and make something beautiful from a literal lump of clay. In addition to taking classes, customers can shop the gallery for gorgeous, one-of-a-kind art pieces. The gallery carries the work of over 100 artists, in pottery, jewelry, wood, glass and more. The Hudaks say it is very important to them that the items in their gallery are handmade by the artist. In a world of mass-produced, factory-made items, Throwing Mud is a place where shoppers can buy a special item that is handmade.